It’s always a pleasure to review the outstanding publications that come through NGV. 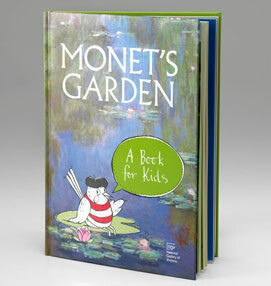 In Monet’s Garden; A Book for Kids there is so much to enjoy. The book is a carefully considered creation, aimed at educating children on important and interesting subjects that are approached in a way that they can understand while being entertained. Pierre the mascot introduces himself as the guide throughout the book. It initially touches on The Impressionists and introduces Monet as a young man who didn’t like school therefore drew doodles of his teachers on the covers of his books during class. It is through the Did You Know? sections of the book that lots of interesting information is presented. Did you know that: Monet’s first name was Oscar, not Claude, that’s why his early drawings were signed ‘O. Monet’; that as a teenager, he saved money to go to Paris and study by sketching portraits of important people of his area which were sold from the local supply store; that the landscape artist Eugene Boudin’s invitation to Monet to join him on a painting trip initiated the artist’s lifelong love of outdoor painting; that the first painting by Monet to be seen in Australia was Rough Weather at Etretat purchased by the NGV in 1913? There’s more of these delicacies to be savoured. Children learn about Monet’s family, fame and fortune, Paris in the 1800s, and through Guess What? discover Monet’s sleeping and eating habits, who his friends were, and about his passion towards all things Japanese. Monet even had a Japanese bridge built on his property, and collected Japanese woodblock prints which still hang in the dining room at Giverny. There are lots of jokes, riddles and activities for children that encourage reader participation through artistic expression, internet research and outdoor activities. It delves into French life and food and includes Monet’s favourite Tarte tatin with recipe; how to examine paintings with a questioning and observant eye, try origami and grow sunflowers, and how to take photos in order to discover light and shadow. (the last three with instructions) There is an I Spy game for when travelling, templates to photocopy and quizzes. This brilliantly designed book is full of entertainment and learning. The price is extremely moderate. At the end there is an Illustrated List of Works, with reference information, and a double paged List of Comparative Works. Highly recommended and certainly value for money.